My name is Karin and I am Rory’s Mom. I can’t tell you how thrilled we are to have been asked to share our story on beyond the waves blog. Seeing the strong bond between Julia and Michael gives us such hopes for our own children that even though there maybe differences the Love is still the same. Our sweet Rory is two and half years old and is the youngest of our three children. Being a mom has been the most amazing experience of my life and has given me more joy and purpose then I could have possibly ever imagined. I always knew I wanted three kids and Rory was the final piece that was going to make our family whole. My pregnancy was very similar to my other two, no complications and I loved every minute I carried them around in my belly. When it came time for my ultrasound I had no worries and as I had imagined we were told everything was conpletely normal and our baby boy was looking healthy and growing just as he should. Fast forward to September 14th 2015 (my due date) and Rory was ready to make his entrance into the world. Just like my other kids his delivery was easy and stress free. My doctor layed him on my chest and initially I was stunned by how quiet he was, no crying or sounds of any kind but then I saw his face and my heart tripled in size, I was in love all over again. The doctor and nurses said their congrats and left us to marvel at this beautiful creature that found his way into our lives. It was magic. Down syndrome was never uttered and not once did my husband or myself question it so we continued to lay there in sweet bliss. Fast forward two days and after some issues with clotting and jaundice we were released and headed home as a family of five. Life was normal, up until September 21,2015. That Monday was Rory’s newborn appointment with his pediatrician and I can honestly tell you that the person I was when I walked into that office is not the same person that walked out. They say there are moments in your life when time seems to standstill, that moment came for me that morning. When at the end of what I thought to be a normal check up despite being asked some out of the ordinary questions our doctor sat down and said the words I will never, ever forget. “I’m asking you these questions because I believe that Rory may have Down syndrome”. Time literally stopped. My breathing, my mind, my ability to speak just stopped. When it all came back I just remember sobbing, how could this possibly be. I felt guilty that somehow I let Rory down, I grieved openly for the “normal” child I thought I had. Our pediatrician who was so kind and sensitive put her hand on mine and said “this doesn’t change anything, he is still the precious boy you walked in here with, that hasn’t changed”. She was right, my goodness if I could go back now how differently my reaction would be. How blessed and lucky we were to have him and all the “extras” that came with him. Rory is the youngest out of my three children. There is quite an age gap between them, 9 years between his brother Finn and 5 years between his sister Harper. I was always worried up until he was born that somehow the gap was too large and they wouldn’t be close leaving Rory out of the mix. When we learned of his diagnosis my heart broke thinking they’ll never be close and the possibility of friendship outside of being siblings was now impossible. I am so happy to tell you that could not be farther from the truth. Rory and his siblings are all close and very loving (not to say there aren’t moments of getting on each other’s nerves but nothing out of the ordinary). 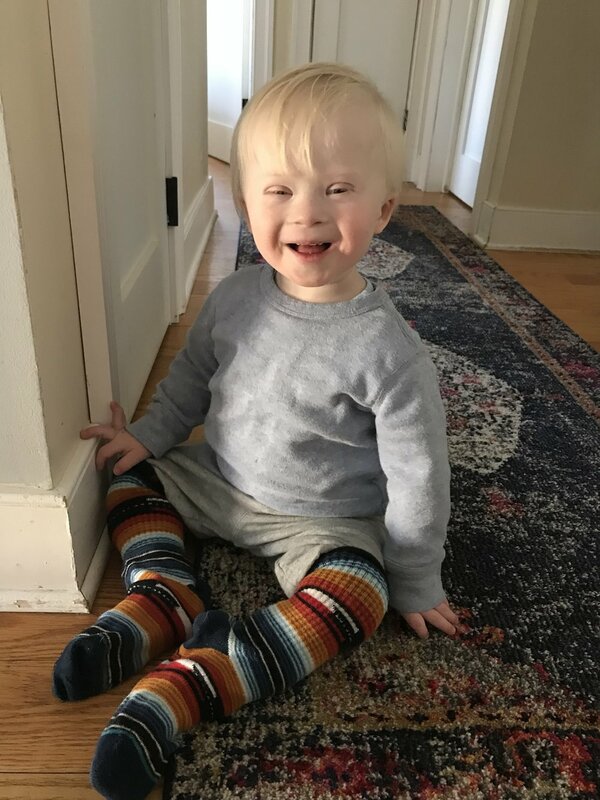 Finn and Harper treat Rory no differently, they understand Down syndrome is something he was born with but that it doesn’t define who he is as a person. I know my kids will have more compassion and understanding and perhaps will view the world differently, more kindly thanks to Rory. As for his part, Rory is a typical two year old boy. He’s on the move constantly and loves to kick balls all over the house. He currently has therapy twice a week and shows us everyday how determined and smart he is. As his mother I still have those moments of sadness when I think perhaps life won’t exactly be the same for him, but I know that even though his journey maybe different then most I am determined to help him make it an awesome one no matter which route we end up on. Down syndrome has taught me that sometimes the most amazing things that can happen to you aren’t necessarily the things you imagined. We are blessed. Thank you so much for letting us share a part of our story. We are so grateful to have met so many awesome people on this journey.